Soft rubber grips with finger grooves for a more secure grip on the Ruger Mark III 22/45 RP pistol (model with the replaceable grip panels). Grip is ambidextrous. Available in either Black or OD Green color. 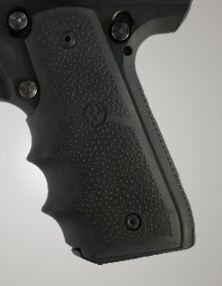 NOTE: These grips will ONLY fit the 22/45 that has grip panels that can be replaced.